Why Say It With A Sign™? 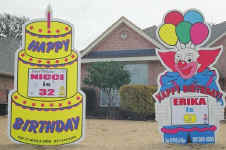 Give someone special a wakeup surprise by having us decorate their yard before 5 am with a huge 8-foot personalized special occasion sign! Click the signs link above to check out our selection of signs. Look how BIG the Say It With A SIGN™ signs are! Say It With A SIGN™ signs come with unique personalized computer designed nameplates which are printed on a durable plastic board. What makes Say It With A Sign™ unique is the personalized name plate the recipient will treasure for years to come. And best of all . 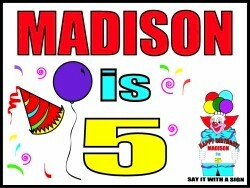 . . you fill in the blanks to celebrate the special occasion!